Perth is a wonderful City. We have fantastic weather, great beaches, beautiful blue oceans, gorgeous park lands and brilliant city and surrounding areas. There are a million things to do that are free or will cost very little. So if your looking for something to do that won't cost you a fortune – here are just a few suggestions. 1. Perth is famous for its beautiful beaches, so why not visit one of them. Enjoy a walk along the shore, have a swim or grab some fish and chips and watch the sunset. This is a great place for the whole family. 2. Go for a walk. Stroll around the streets of Fremantle or Perth or even your own neighbourhood. Visit Kings Park and follow one of the walk trails through the wild flowers, enjoy the native surrounds and views of the city and the Swan River. 3. Take a CAT bus ride and see the city. There are some wonderful places to visit around the city and you may be surprised at some of the beauty around the city. 4. Tour some old historical buildings. 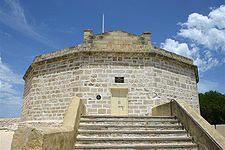 There are plenty of old cultural, historical buildings in Fremantle and Perth, plenty of new and interesting ones too. Visit the old Prison, the Roundhouse, the Cathedral or the Swan Bell Tower. 5. Go window shopping. Stroll through the arcades of Perth or any of the many large shopping centres in the area. This is free and the next time you need something, you will know exactly where to go to get it. Or you may just see something that you will fall in love with something and just have to have there and then. 6. Go for a picnic or BBQ. Invite your friends or family. Grab some food and plenty of soft drinks and head off to one of the many parks or beaches in the area. Take a frisbee and make an afternoon of it. 7. Take a train ride. Visit Rockingham or Mandurah. Do a bit of shopping or sight seeing or wander down to the beach. Grab an ice cream and watch the sun set. 8. Go for a bike ride. Ride around your neighbourhood, the park or the river. Take your dog or your family (or both) for a nice afternoon together. 9. Visit the Library. Check out a couple of good books or see what kind of activities are going on. There is always something going on at your local library for everyone to enjoy. 10. Browse through the markets. Stroll through the stalls of Fremantle Markets or one of the many open markets in the local areas. Whether or not you choose to do some or all of these activities, these are free and interesting activities available for you and your family any time, any day.